It's prime beach season, and as fashion lovers, we know you want to be as stylish as possible both in and out of the water. If you're looking to kick-start a surfing hobby this summer, you want to make sure you're armed with the right gear (starting with your swimsuit). Put your string bikini off to the side and opt for a sporty one-piece, but don't let it stop there—what to wear surfing (and when you sunbathe afterward) is crucial. 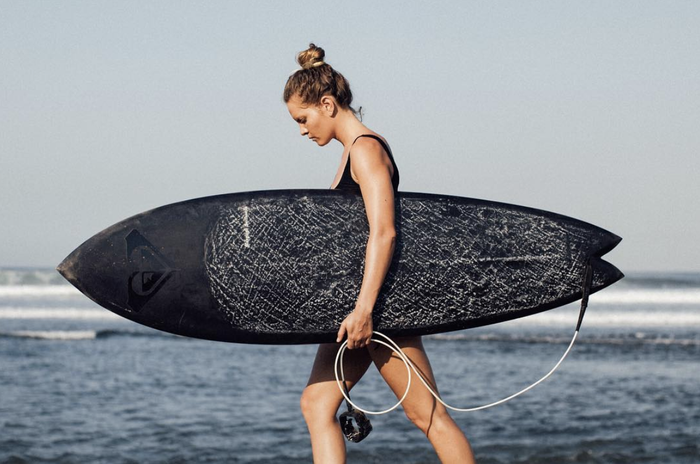 We enlisted professional surfer Bruna Schmitz for her best advice on what to wear surfing. From what she wears while carving through the waves to what she wears after she's finished, this surfer has the beachy style down. "A spring suit (a suit with arm coverage) would be ideal for beginners," she tells us. "It's cute and comfy while still keeping everything together." Schmitz also shares that her beach bag consists of three key items: baggy pants paired with tops or maxi dresses. "When surfing, it's so important to have comfy (but cute!) clothes because you are sandy and wet all the time. This will set you apart from other beginners." Now shop some of the four key items inspired by this pro surfer's advice for your next trip to the beach. You'll look so good on the waves in this. Make a statement with this bold suit. A classic cut and color. This will look so cute before and after you're done at the beach. A classic crop top is all you need at the beach. Wear this with a pair of cutoff shorts. A simple halter will be great for the hottest of days. Wear these to the beach or to brunch. You'll want to wear these everywhere you go. Linen pants are so great for the beach. This will be so comfortable after a long day of surfing. Throw this on after you're finished surfing. The perfect throw-on-and-go type of dress. This dress will take you from the beach to the boardwalk cafe. From simply being out on the water to actually getting up on the board, the thrilling experience is one you won't want to miss.